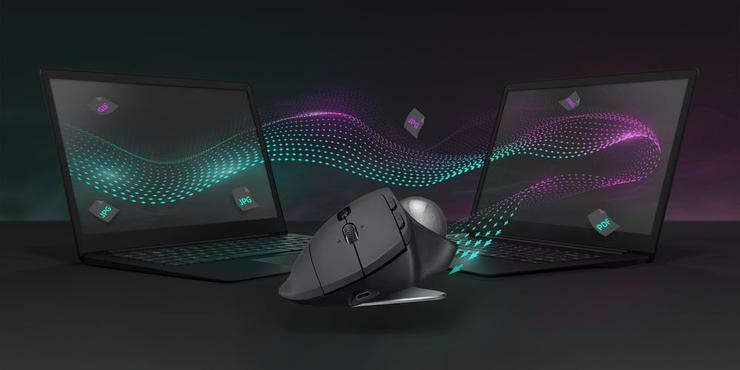 Logitech has announced Logitech MX ERGO, a wireless trackball which they say that sets a new standard for comfort and precision. The company's first new trackball in nearly a decade, Logitech’s MX ERGO is said to offer personalised comfort via a unique adjustable hinge, precision tracking and multi-device connectivity. “We are so excited by this new trackball, It is back, better than ever and the idea for this trackball innovation was inspired by our users, who invented creative ways to achieve their desired level of comfort, sometimes adding additional wedges under their trackball for elevated angles,” said Anatoily Polyanker, Global Portfolio and Brand Director at Logitech. Logitech claim the MX ERGO reduces muscular strain by 20% compared to using a standard mouse. Using the adjustable hinge, you can also increase the angle from 0 to 20 degrees to improves posture and pronation. They say the carefully sculpted shape gives your hand full palm and finger support, while the soft rubber on the top ensures a good, comfortable grip for long hours of work. Featuring a rechargeable battery that lasts up to four months on a full charge, the MX ERGO also comes fast-charge ready - giving you a complete day of work with just one minute of charge. It also comes integrated with both Logitech Easy-Switch and Logitech Flow. This allows users to seamlessly switch between two computers with one mouse, and even copy and paste content, images and documents between them. The Logitech MX ERGO is priced at $129.95 and will be available at Logitech.com and selected retail stores throughout Australia in October.